Saving Grand Turk’s precious coral after the hurricanes. Until the 1980s, Elkhart corals were one of the most common reef-building corals in the Caribbean. In September 2017, back-to-back hurricanes severely damaged the island of Grand Turk (as well as other islands in the Turks & Caicos). But not all the damage was readily visible. At the southern tip of Grand Turk, in about four to six feet of water, there exists a lovely stand of critically endangered Elkhorn coral (Acropora palmata). 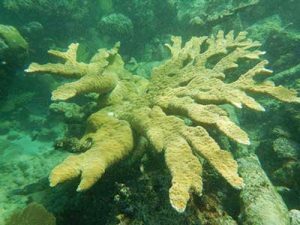 Elkhorn corals are large, fairly fast growing, branching corals that, up until the 1980s, were one of the most common reef-building corals that protected beaches throughout the Caribbean. Unfortunately, a coral disease attacked Elkhorn corals throughout the region and virtually wiped them out. So protecting the remaining healthy Elkhorn reefs is important. Sadly, many large branches were broken off the Elkhorn corals on the southern tip of Grand Turk by the waves generated by the hurricanes. Some may have naturally survived, as this is one of the methods by which Elkhorn coral propagate, but many were laying in sand and would likely have died. The Turks & Caicos Reef Fund (TCRF), the only active environmental non-governmental organization in the Turks & Caicos Islands, was contacted by DECR Environmental Officer Katharine Hart to see if there was anything that could be done to save these critically endangered corals. Fortunately, the TCRF was already working on propagating Elkhorn corals in a nursery set up a year earlier off the northwest coast of Providenciales and agreed to assist with the rescue effort. The TCRF’s coral nursery work is funded through a European Union programme called BEST (Voluntary Scheme for Biodiversity and Ecosystem Services in Territories of European Overseas). The grant was awarded to Wageningen Marine Research based in the Netherlands and the Turks & Caicos Reef Fund is one of four organizations selected to work with the Dutch researchers on this research project. It is called RESCQ (Restoration of Ecosystem Services and Coral Reef Quality). 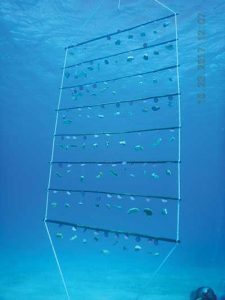 The goal is to test a new type of nursery set-up—attaching corals to bamboo poles suspended by ropes on each end—what are called coral ladders. The design keeps the corals suspended in the water column where they can have easy access to all the nutrients and sunlight they need to grow. Following the storms, Katharine Hart gathered up many of the broken pieces of Elkhorn coral and placed them in improvised trays placed on cinder blocks to keep them off the sand until TCRF staff and volunteers could install the coral ladders. A total of four ladders have been installed off shore from Governor’s Beach on Grand Turk, not far from the Biorock structure that was set up a number of years ago in an earlier effort to grow corals. This coral ladder keeps corals suspended for easy access to nutrients and sunlight. The salvaged pieces of coral were frequently too large for the ladders, so were broken into smaller pieces with a hammer and chisel. Each fragment is measured and photographed with its identification tag before it is hung on a ladder, using monofilament line to secure them. The line is quickly grown over so that within a few weeks, where the monofilament touches live coral it is covered with live coral. So many fragments of coral were salvaged that the four ladders were quickly filled with 261 coral fragments. It is expected that these corals will begin growing again and will do so fairly quickly. The Elkhorn corals in the Providenciales nursery nearly doubled in size in six to nine months, after which they are refragmented (broken into smaller pieces) and returned to the nursery. Eventually, all the nursery corals will be returned to the reefs from which they were collected in an effort to re-establish healthy growths of these important corals throughout the TCI. After just a month in the Grand Turk nursery, there is already evidence of new growth on many of the corals and wounds caused by the storms and the fragmenting of larger pieces are beginning to heal. Attaching coral fragments to a rebar structure is one way to transplant them back to the reef. The biggest challenge in keeping the corals healthy and growing is controlling algal growth on the ladders and on wound sites on the corals themselves. At least biweekly trips to the nursery are required by scuba diver volunteers, DECR staff and TCRF staff using toothbrushes to remove algae from the coral fragments. Eventually, the corals will be transplanted back to the reef site. Two techniques will be used to secure the fragments. The first is direct attachment to hard substrate (rock) using cement or epoxy. This technique will be used for larger fragments. The other technique is to use monofilament line to attach smaller coral fragments to a rebar structure secured to the sea floor. Eventually, the rebar will be invisible as it will be completely grown over by the corals. In the end, it took a team effort by the DECR, TCRF, Bohio Resort dive staff and Blue Water Divers dive staff to save so many critically endangered corals that would have been otherwise lost. 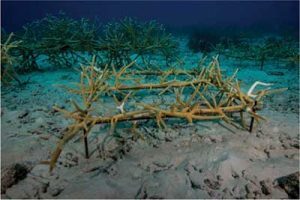 In a few years, this post-hurricane effort will yield healthy new stands of Elkhorn coral off the coast of Grand Turk. Anyone wishing to donate or assist the TCRF in any way can contact them at www.TCReef.org. Scuba divers visiting the Islands are encouraged to make a $10 donation through the purchase of a dive tag that can be attached to their dive gear to show their support. Snorkelers can show their support through the $5 purchase of a pink or blue silicone wristband. A complete list of outlets for TCRF merchandise can be found on the organization’s website, www.TCReef.org. NOTE: This document has been produced with the financial assistance of the European Union. The contents of this document are the sole responsibility of Wangeningen Marine Research and the Turks & Caicos Reef Fund and can under no circumstances be regarded as reflecting the position of the European Union.